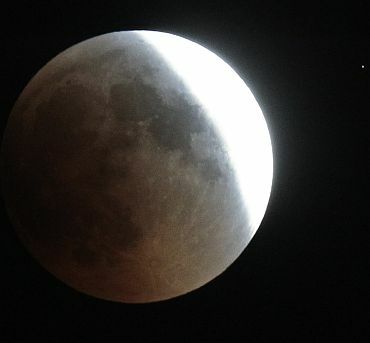 Moon's bright white glow turned crimson brick red when it delved into the dark centre of the Earth's shadow during the century's longest and darkest lunar eclipse. The awesome spectacle of the moon being eclipsed was visible all over the country, including national capital New Delhi. The full moon appeared much dimmer than usual, but sunlight passing through the Earth's atmosphere gave the lunar surface a deep reddish hue. 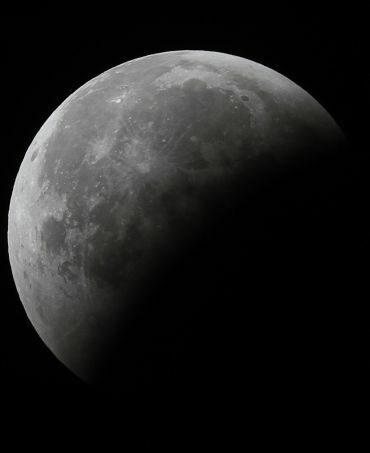 This was the century's longest and darkest total lunar eclipse as the Moon immersed deeply inside the umbral (darker) shadow of the Earth, Nehru Planetarium Director N Rathnasree said. The total phase of the eclipse lasted 100 minutes. The last eclipse to exceed this duration was in July 2000. The next such eclipse will only take place in 2141. 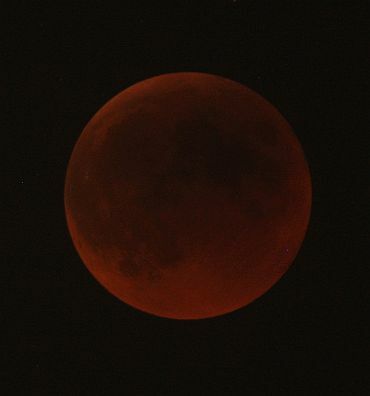 The penumbral lunar eclipse began at 22:54:34 IST and will end at 04:30:45 IST, she said. 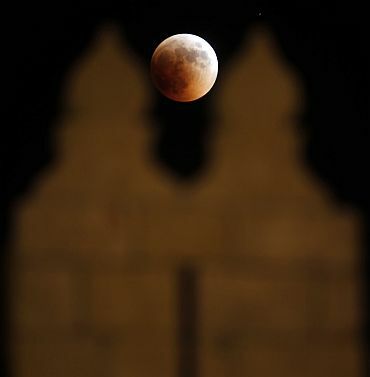 The total lunar eclipse began at 00:52:30 IST and ended at 02:32:42 IST. While the partial eclipse began at 23:52:56 IST and ended at 03:32:15 IST. As the earth came in between the sun and the moon, its shadow first began sweeping across the moon blocking out much of its bright light and as the shadow descended gently, the moon's face turned red. 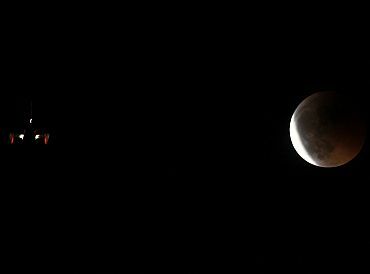 A lunar eclipse occurs when the Earth in course of its orbit around the Sun, comes between the Moon and Sun in such a way that Moon is hidden in the shadow cast by Earth. This can occur only when the Sun, Earth, and Moon are aligned in a straight line, C B Devgun from Science Popularisation Association of Communicators and Educators (SPACE) said. 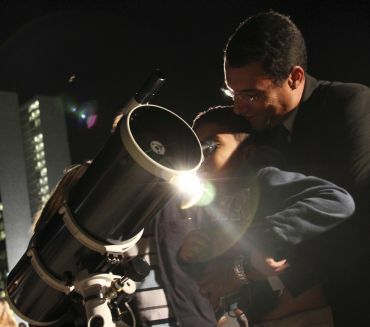 People living in eastern Africa, the Middle East, central Asia and western Australia were able to watch the entire eclipse, from beginning to end, Arvind Paranjpye, scientific officer of Inter-University Centre for Astronomy and Astrophysics, said. At mid-eclipse, the Moon was overhead at Mauritius. Observers in eastern Brazil, Uruguay and Argentina witnessed in totality. However, none of the eclipse was visible from North America, he said. The eclipse is also one of the darkest due to the ashes thrown into the Earth's atmosphere by the recent eruption of Iceland's most active volcano, Grimsvotn, he said. The magnitude of the eclipse was 1.70 magnitude, N Sri Raghunandan Kumar of Planetary Society of India said. Also, a star named 51 Ophiuchi was occulted during the eclipse. At 11:29 pm, the Moon occulted (hide) behind the star 51 Ophiuchi. The star reappeared after 90 minutes at 01:01 am of June 16, Kumar said. A series of activities were planned by Vigyan Prasar, Department of Science and Technology, along with the Nehru Planetarium and the Children's Resource Center of the Nehru Memorial Museum and Library. 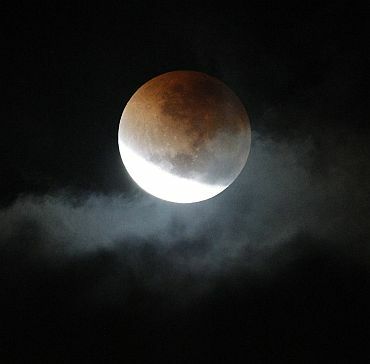 An all night lunar eclipse 'Moon Carnival' was celebrated by all sky enthusiasts here in the capital. SPACE, an NGO, organised a feast for people to help them break the myth and superstitions associated with the celestial phenomenon. Many people still believe that eating food during eclipse harms the body. SPACE will encourage eating during the eclipse and then reporting the condition of your health before and after the phenomena. This cumulative report will be sent to UNESCO, SPACE scientific officer Mila Mitra said. Is that Mahatma Gandhi's face on Mars?